Does your city have a flag? Not your state. Your city. One of the 8,743,921 reasons why Chicago is awesome is that it has its own flag. I never knew Atlanta and Los Angeles has their own flags and am now sad that I do (I looked them up)… cause they are terrible. But Chicago? Chicago’s iconic flag can be found all over the city and all over its citizens. In fact, you can peruse tattoos the flag has inspired at the Chicago Flag Tattoos website. Chicagoans are incredibly passionate about their city and take great pride in this banner. In an article titled, “Chicago’s Flag Is a Much Bigger Deal Than Any Other City’s Flag” from Chicago Magazine, the author explains the symbolism behind the field of stripes and stars. A few summers ago, Chicago was in contention for being a host city for the Olympics. Had this happened, a fifth star would have been added. I love that the flag is a reflection of the city’s past but also open for all the great things that it has in its future. 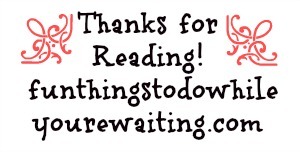 I just wanted to share this with you guys to give non-residents context before you read Sheila’s guest post today. Does your city have a flag? Were you aware of it? If it doesn’t, what would you suggest? 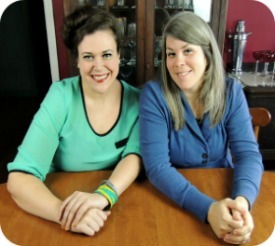 Thanks, as always, to our consummate guest contributor Sheila for bringing us yet another killer guest post! 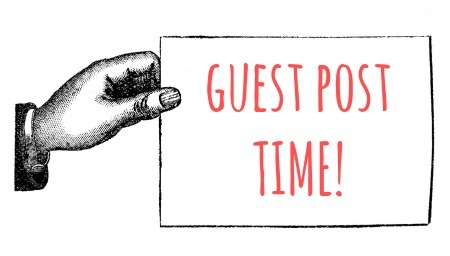 Find the rest of Sheila’s guest posts here! 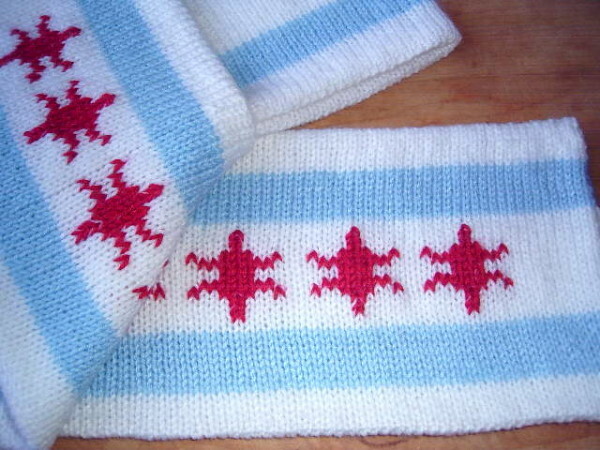 My husband asked me to knit a Chicago flag scarf for him, but to my surprise there was no such pattern in the Ravelry database. 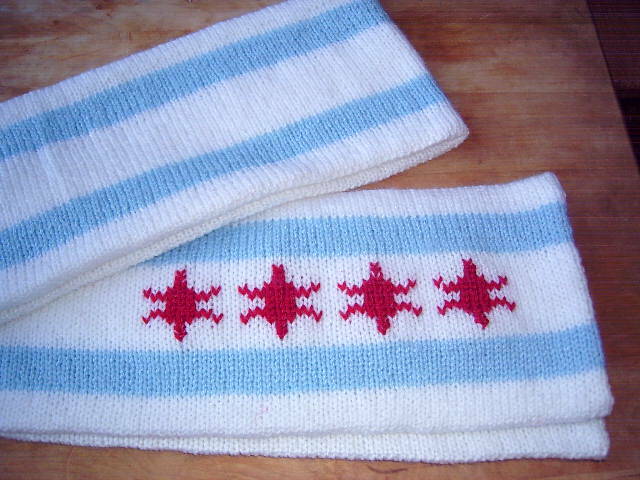 So, I came up with an easy, reversible pattern that I’m happy to share with my fellow Chicago lovers! However, if I were making it again I’d make a few changes. First, I’d cast on fewer stitches because it came out very long (and stretches even more in the wearing), and second, I’d make it in two pieces (instead of just one) and seam them together lengthwise to make the long edges lay flat more easily. I’ve re-written the pattern to make the scarf a more reasonable length, but will present both seaming options for you to choose from. The pictured scarf was made using the “Tube” method. The scarf is knit lengthwise, in stripes, and the stars are added at the end using duplicate stitch. (I tried knitting them in by the intarsia method, but that didn’t work well, presumably because the motifs are so small). With white yarn, cast on 302 stitches provisionally. (You may use any method, but I prefer Lucy Neatby’s crochet one, especially for the “Tube” version of the pattern as it simplifies the grafting step), leaving a 12″ or so long tail for seaming. Weave in all loose ends except the long tail for seaming. Place provisional stitches onto a long circular needle and remove waste yarn (or place 20 or 30 stitches at a time onto a dpn as you go; if you used crochet cast-on, you may skip putting the stitches back on a needle and just work with them as they are, removing the waste yarn at the end). Fold the scarf lengthwise with wrong sides facing inside and graft Row 95 to the cast-on stitches. Remove any remaining waste yarn, weave in ends. Work as for Tube method up to Row 48. Place these stitches on a holder. Make a second piece as before, but leave the Row 48 stitches on the needle. Place provisional stitches of the first piece on a long needle (or 20 or 30 stitches at a time on a dpn) and bring two pieces together, with wrong sides facing on the inside. Join the two pieces lengthwise very loosely with three-needle bind-off. 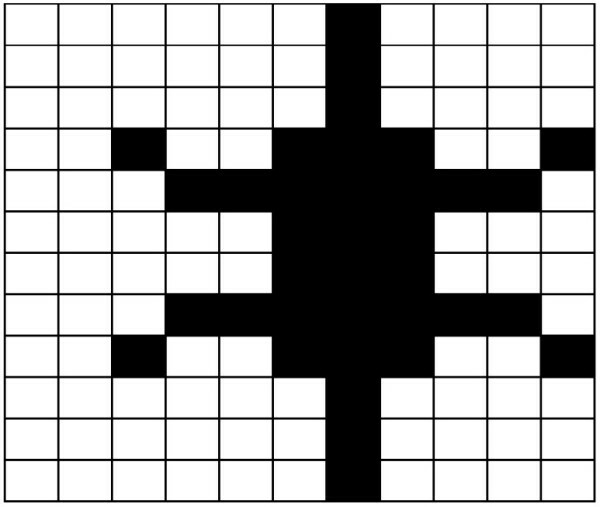 Repeat on remaining two edges. With Red, work 4 repeats of color chart on each end of each side in duplicate stitch, beginning chart 12 stitches from edge (i.e., lower point of star should the 17th stitch in from the side). Weave in ends. Seam ends closed, weave in ends. For “Tube” method, the fold may be sharpened with blocking and ironing (use an ironing cloth for acrylic).